Ankle sprains or twisting injuries of the ankle are one of the most common foot injuries and can happen to just about anyone. These injuries most frequently occur while playing sports such as basketball and tennis where there is frequent lateral motion of the foot, but can also occur from simply misstepping while descending a flight of stairs or even just having the foot land wrong on an uneven surface. After twisting or “spraining” your ankle it can be very painful and difficult to know how serious the injury is and whether or not you should see the doctor. Below are the top 4 signs that your ankle injury may be serious. Swelling. It looks like there’s a baseball on the side of your ankle. The more swelling in the foot and ankle there is and the faster it develops, the more likely it is that things are ruptured, torn, fractured, dislocated, etc. All the pretty colors! 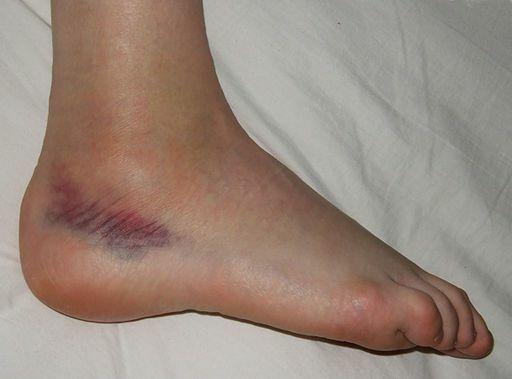 If you see bruising; black, blue, red and/or other colors appearing on the side of your ankle after your injury this is an indication of bleeding under the skin. And bleeding under the skin indicates tissue damage. You don’t know if the damaged structures are ligaments, tendons, bone or all of the above, but something is not right. You can’t bear weight on your foot. Most of the time you WILL be able to bear weight on a sprained ankle, but if you can’t bear weight at all or if it’s extremely painful to even try then you’re probably looking at something a bit more serious. Wait until tomorrow. The side of your ankle has the shape of a grapefruit with a massive bruise and you can’t even walk on it, but you’re still not convinced that it’s something serious? Just wait and see how it feels the next day. Pain and inflammation will continue to increase for approximately 48 hours after the injury, so if day two is even worse then you should probably consider getting it checked out by a specialist. All too often when faced with a potentially serious foot and ankle injury people ignore the symptoms and don’t take the proper steps to treat their injury. This can lead to chronic problems, pain, swelling and ultimately to an ankle that is unstable. If you have questions about your foot or ankle sprain and are not sure if your injury warrants a trip to the doctor, give us a call at 562-433-0478. It is always better to side on the err of caution in order to keep you healthy and on your feet.